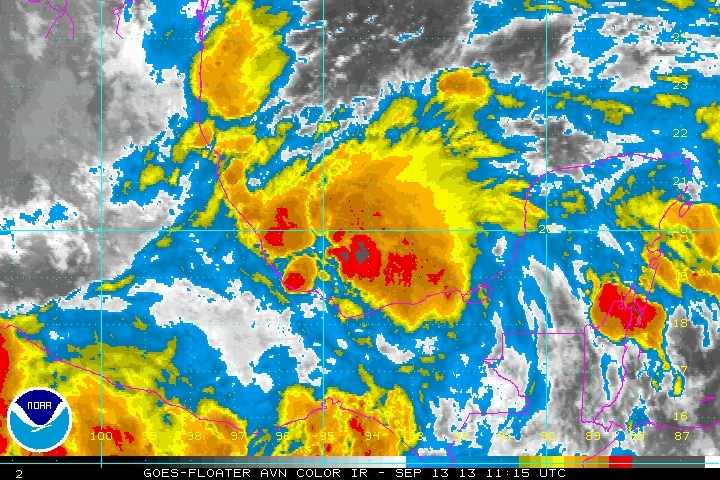 After spending several days in the northwestern Caribbean, a tropical disturbance finally emerged in the southern Bay of Campeche. It didn't take long for it to organize into a tropical depression. It is likely that it will strengthen into a tropical storm during the next 12 hours. At this time the main threat will be heavy rainfall with flash flooding on the northeastern Mexican coast. As of 4 pm cdt (5 pm edt) TD 10 was centered at 19.7 N / 93.6 W or about 175 ENE of Veracruz, Mexico. It was moving west at 7 mph. Top sustained winds estimated at 35 mph (35 mph NHC 4 pm cdt advisory). Pressure was estimated at 1003 mb. Forecast models take TD 10 slowly wnw, then nw after several days into northeastern Mexico. With this slow motion, it is likely that serious flooding will occur. TD 10 is likely to become tropical storm Ingrid later today. Even though it has been slow to organize, it has had great impact. TD 10 is expected to produce 25 inches of rainfall where heavy rain bands persist. As of 7 am cdt (8 am edt) TD 10 was centered at 19.5 N / 95.0 W or about 75 ENE of Veracruz, Mexico. It was moving WSW at 3 mph. Top sustained winds estimated at 35 mph (35 mph NHC 7 am cdt advisory). Pressure was estimated at 1000 mb. Ingrid is still somewhat disorganized. It is expected to strengthen into a minimal hurricane just before approaching land. 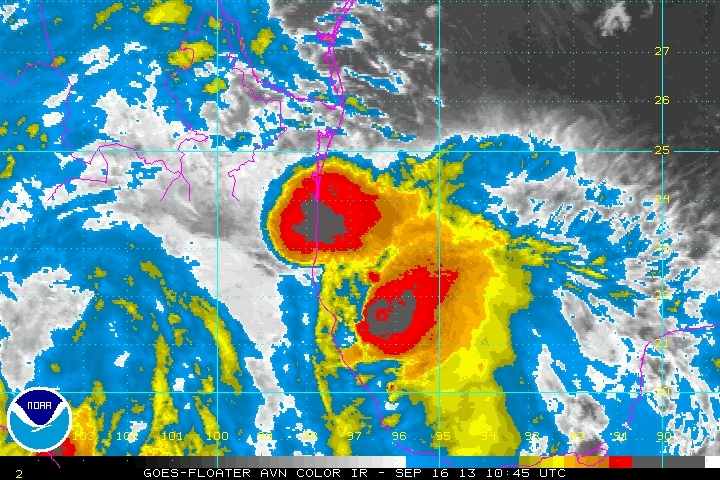 Ingrid is expected to produce 25 inches of rainfall where heavy rain bands persist. As of 4 am cdt (5 am edt) Ingrid was centered at 19.8 N / 95.0 W or about 90 ENE of Veracruz, Mexico. It was moving NNE at 3 mph. Top sustained winds estimated at 60 mph (60 mph NHC 4 am cdt advisory). Pressure was estimated at 991 mb. Forecast models take Ingrid north then west into northeastern Mexico by Sunday night. With this slow motion, it is likely that serious flooding will occur. Power outages will also be a concern in locations that receive winds greater than 50 mph. Ingrid is still not symmetrical and the latest recon did not support a sustained wind speed of 85 mph. Gusts of 105 mph should be seen with a hurricane of that strength. Because of this, my wind estimate is lower than the hurricane center's estimate. Ingrid is fighting wind shear, contributing to the poor appearance of satellite imagery. It is possible that the shear will weaken before landfall allowing for some strengthening. In fact NHC has Ingrid as a category 2 hurricane at landfall. 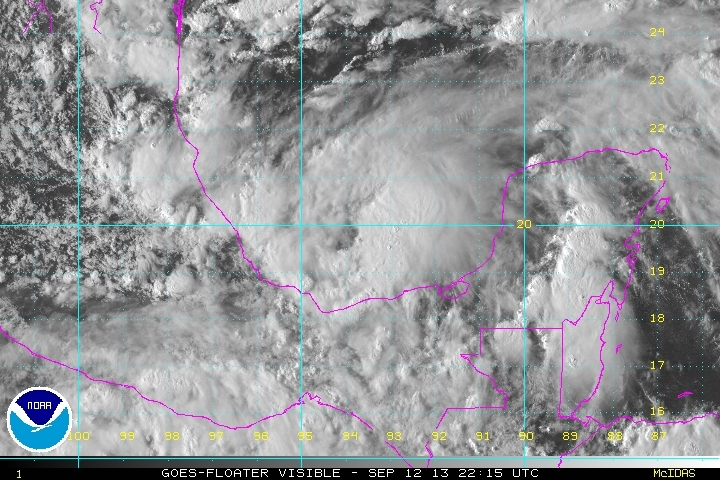 As of 7 am cdt (8 am edt) Ingrid was centered at 22.5 N / 95.6 W or about 150 east of Tampico, Mexico. It was moving NW at 7 mph. Top sustained winds estimated at 75 mph (85 mph NHC 7 am cdt advisory). Pressure was estimated at 987 mb. Forecast models take Ingrid west into northeastern Mexico by late tonight. With this slow motion, it is likely that serious flooding will occur. Power outages will also be a concern in locations that receive winds greater than 50 mph. 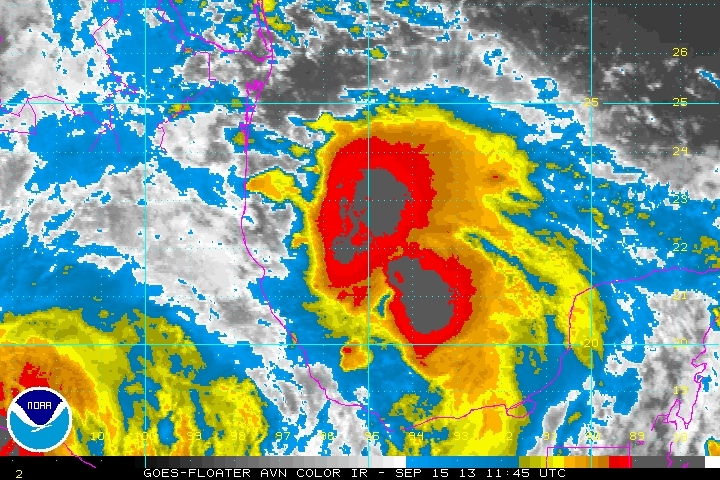 Ingrid's circulation looks ragged this morning with two distinct bursts of convection. It probably is not a hurricane but may have some gusts to hurricane strength. Wind shear has continued to not allow further development as it has approached the coast. Ingrid will move inland and begin to weaken later today. Winds will continue to pose a problem as will heavy rainfall. 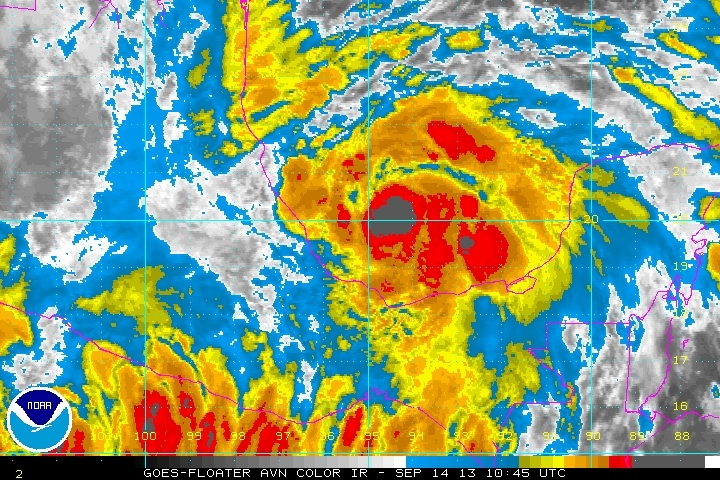 As of 4 am cdt (5 am edt) Ingrid was centered at 23.4 N / 97.1 W or about 50 east southeast of La Pesca, Mexico. It was moving WNW at 7 mph. Top sustained winds estimated at 70 mph (75 mph NHC 4 am cdt advisory). Pressure was estimated at 989 mb. Forecast models take Ingrid west into northeastern Mexico by later this morning. Ingrid has been inland and is weakening quickly. The threat of heavy rainfall will continue.